Q: How is your window cleaning Finchley going to bring back the transparency of my panes? In-house window treatment – The experts will remove dirt with ladders and squeegees. Q: Can you polish my panes during harsh weather? A: If you spot dim clouds on the day of your session, don't be alarmed. The window cleaners in Finchley can still do the service as long as they're facing a light shower. However, in the event of a rainstorm, we will kindly ask you to postpone your appointment to avoid any injuries. Q: Can I assist the experts in any way? A: Yes, you can! The cleaning team will require a empty parking slot in close proximity to your premises (30 metres or less) and on the same side of your casements. Q: Do I have to meet up with the technicians in person? A: It's no problem for the team to wash the outer surfaces of your windows as long as they are free to walk past your front gates. And if smears have landed on your inside surfaces as well, just tell us and we'll conduct a free key pick-up and delivery. Q: What if my technician does not arrive on time? A: We will immediately inform you about the cause of the expert's delay and notify you once he appears near your property. Q: Can you polish PVC frames and sills? A: Yes we're licensed to clean any type of pane or window part. What's more, every PVC or UPVC frame or ledge will be cleaned at no extra cost! A: Yes, we can, but we'll only rinse the external surfaces with the water-fed pole. When you schedule a window cleaning Finchley session, you'll be able to renew the casements of any premises at reasonable rates that remain unaltered by minimum contracts or hidden payments. See if you agree with our opinion – stop by our handy price table below. 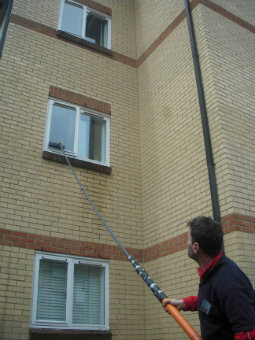 With window cleaning in Finchley, you can quickly remove ancient splodges from any commercial or residential property. Read on to discover how. To clean your windows' outside side, the practiced window cleaners in Finchley will use the latest cleaning gadget – a water-fed pole that runs on purified water. The cleaning tool's notable reach (22 metres) allows the adepts to drive out dirty spots from any four-storey property without using ladders or unhealthy detergents. To deal with stains on multistorey buildings, we've designed a wholly different cleaning procedure – the rope access window cleaning. After estimating your property's dimensions and location, a team of reliable climbers will either use ropes or ladders and squeegees to restore the former glory of your panes. We always organise each session beforehand to avoid injuries and can give you all the necessary COSHH records upon request. To renew windows in-house, the team may have to utilize sponges and ladders to reach higher areas. Do any of your relatives need help with washing away persistent window stains? Keep on reading to learn which regions the Finchley window cleaners can visit. Alternatively, get a free instant quote or order affordable window cleaning services Finchley N2 online, through our web site.